Today I’m going to introduce some of our new kits! We just got in some new product samples, so I can give you an advance look. *The model is still under production. Model shown in the images is a prototype. Final product may vary. Anyways, let’s go ahead and start off with the sprues for the ＜For Modelers Edition＞. Despite being a true 1/144 scale aircraft model and having lots of special features, it’s also a snap-fit plastic model kit. Let’s take a look at the sprues from above and below. First up are the main sprues, D and E.
These two become the top and bottom of one piece. Two of the most troublesome parts of aircraft model kits, the nose and the canards are combined with the main body in order to make the model easier to assemble. The parts are casted in a thin and deep mold, giving them a lot of fine details that make it easy to do the panel lining. Next up is sprue A. This sprue includes parts such as the main wings, ventral fin, and landing gear. There are lots of models these days where you can switch out the parts to open or stow the landing gear, so this time I want to show off the missile parts. The individual missiles can be reconfigured into a variety of formations for different purposes. It’s a bit hard to explain or see in pictures, so I hope you’ll check the model out for yourself! Last up are the B and C sprues. B includes parts for the nozzles, landing gear, and cockpit. C includes the canopy and an attachment for the mini flying base. The ＜For Modelers Edition＞ also includes a frosted gold C sprue. It probably makes more sense to say that the clear plastic canopy is for modelers that prefer to paint their own kits. The gold canopy evokes the image of a stealth aircraft that is coated in order to block interfering signals. The colorless version is very clear, allowing you to paint it with any color of clear paint you like. I’ll leave it up to you how you want to decorate your model. 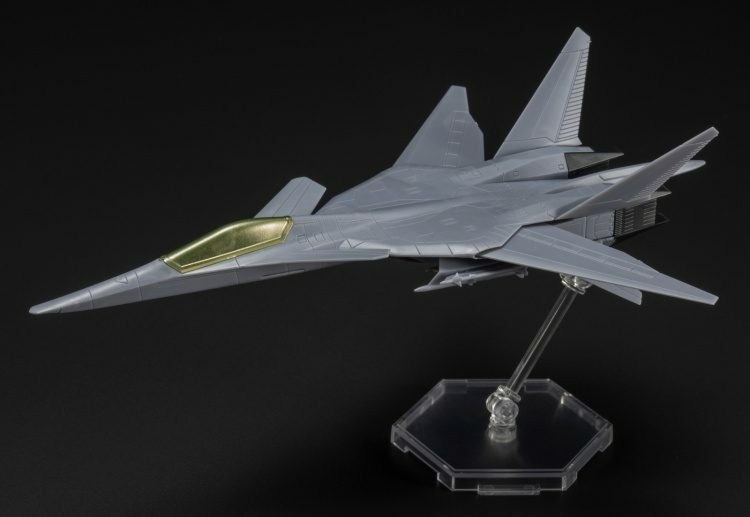 The C sprue for XFA-27 is a smokey gray. As you can see in the picture at the beginning of the post, the canopy is transparent enough to give you a view of the canard on the other side. Next I’d like to introduce some of the assembled pieces. 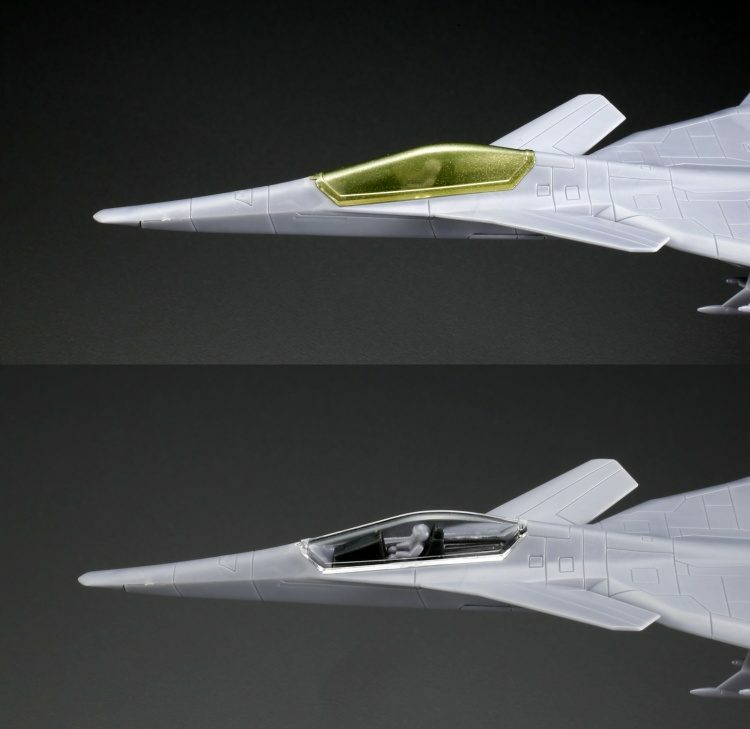 This is from the XFA-27 kit (the difference between the two is whether or not the A sprue with the pilot part is white or gray). 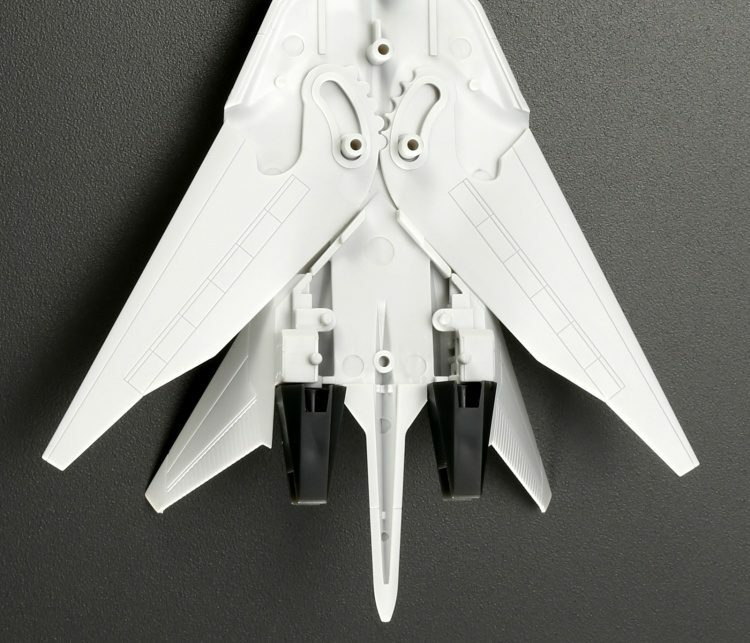 This does not require glue or tiny pins for assembly, but is a simple colored plastic piece that accurately portrays the XFA-27 cockpit. I think more modelers with experience building aircraft will know this, but it’s best to paint the cockpit, build it into the machine, and then mask it to protect the paint as you continue building. Here’s an image with the main wings folded inwards on top of the aircraft. Please note that this was achieved by assembling the parts in a different order than usual for explanation purposes. The picture helps to show how well the gears fit together and the placement of the stoppers combines that allow the wings to be adjusted in conjunction with each other. I tried opening and closing the wings by pulling them slightly, and they moved pretty smoothly even on the prototype. Finally, here’s a look at the decals. Both versions of the kit include the same decals. For XFA-27, you can use them for the emblems and the rescue hatch. For the ＜For Modelers Edition＞, you can use the decals and paint to make a model with the Scarface Squadron color scheme from scratch. 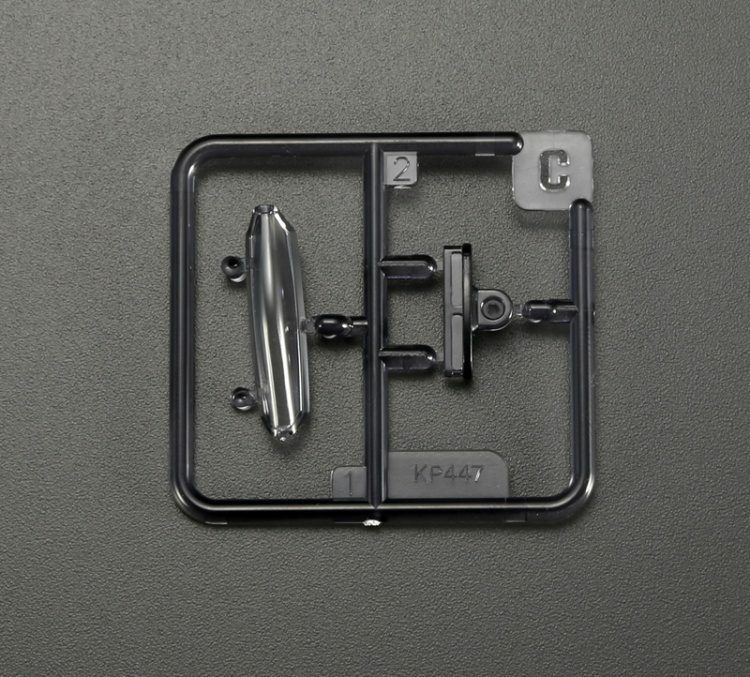 The standard XFA-27 kit is comparatively easy–all you need to do is add the emblem. 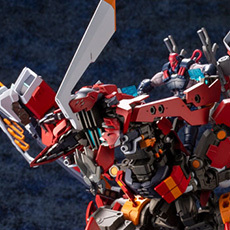 But the light gray color of the ＜For Modelers Edition＞ is great for adding panel lining and details in black. 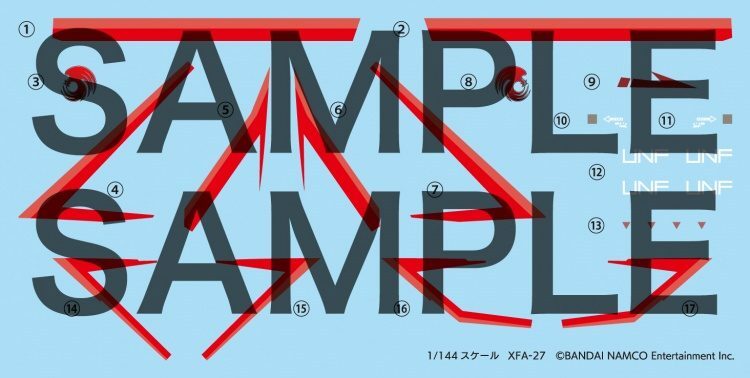 Additionally, the package art was specially drawn by Hidetaka Tenjin. 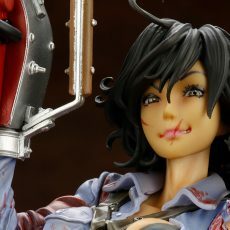 We will reveal the packages at the All Japan Model Hobby Show. I hope you’re excited! 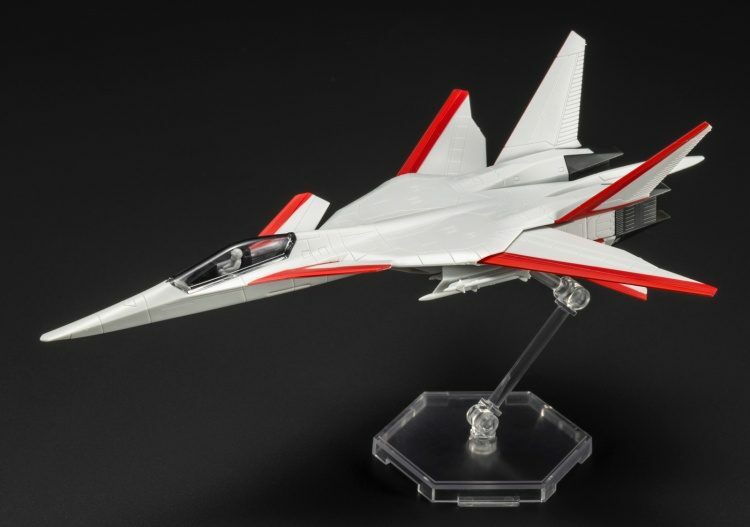 Anyways, that’s all for the first two entries in our ACE COMBAT 1/144 Aircraft series. We’re doing our best to have them ready for you in October! Thank you to everyone who pre-ordered and we’ll have them flying your way soon. If you didn’t pre-order, don’t miss your chance to pick one up from your local retailer!